On this page I give some ideas for how to forgive infidelity. A visitor requests prayer for healing from the hurt caused by her cheating husband. Please join me in a prayer to help her heal from the hurt. Say your own prayer or read the one below. And if you have experienced the same, may God bless you and heal you. I was married for twenty-three years and four more. He cheated on me for twenty years with another woman and had two children with her. I have two of ours and a dog. He deceived and created an emotional toxic situation in our home life. Although my boys are older it doesn't matter their father was a morally wrong for what he did. He walks around as if he's privileged and deserving. Meanwhile my boys and me are trying to figure out what's the truth is. Please pray for us. We could sure use your prayers. I am so sorry to hear your sad story about your husband’s infidelity and double life. You are doing the right thing by finding a safe way to express your anger and frustration. I understand that this anger is made the greater by the fact that your ex husband doesn't show remorse. You are right, your husband was morally wrong for what he did. Just to be clear forgiveness does not mean saying that a behaviour is okay in terms of this world. The aim of forgiveness is to bring you to a place of peace, and for you to come out of this experience without judging yourself as worth less because of the way you have been treated. I do hope the free forgiveness e-book - Releasing Judgement has been helpful to you. In the book, you will have learned about forming release statements. Below you will find some that may help with how to forgive infidelity. Only use those that are relevant to you. You will know which ones they are. Please know that the release is not a moral statement. It simply invites you to take a moment to rest in a place of allowing what has happened to have happened. It's OK to have learned to expect deception from someone in your life. It's OK to have been deceived by someone. It's OK not to know how to expect honesty from someone in your life. It's OK to feel confused about reality because you thought someone’s lies were the truth. It's OK to feel confused about reality when someone else seems so confident they are right. It's OK to find it hard to allow yourself to see what you see. It's OK to find it hard to allow yourself to feel what you feel. It's OK to feel confused. It's OK to feel hurt. It's OK to think you deserve better. The above release statements focus on accepting yourself as you are right now. You could also form release statements on your husband’s behaviour. The free forgiveness e-book will tell you more. It is wonderful that you are feeling your feelings whilst also reaching out for prayer in recognition that healing and peace must be possible, even if they don’t always feel possible. ...click on the book cover above. Thank you for bringing your beautiful child, Grace, to this website in search of forgiveness and healing. Please guide Grace towards peace in her heart. Even her name, God, speaks of how you move in her life to bring healing and peace. Pour out your spirit of love on her and on her sons. I ask you to bind up her wounds and heal her broken heart. Support her in knowing herself as loved even as she feels any feelings or sees things that are uncomfortable for her to feel or see. Grace is your beloved child. I ask my prayer and the prayer of all who come here to help her to see this. Let Grace and her sons heal completely from this experience. Heal their hearts, their minds and their bodies. And when Grace is ready, God, help her to see that behind his behaviour this man too is also your beloved child. Fill this man with your love so that he can be the Light you would have him be. Grace, There is a wonderful quote from Psalm 147 which may help with how to forgive infidelity and find greater peace. "He heals my broken heart. He binds up my wounds." 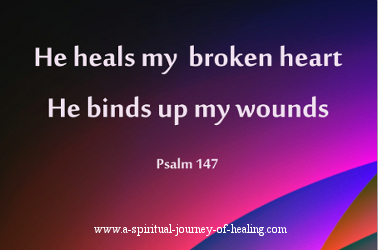 When you are feeling broken or injured, say this beautiful bible quote as a mantra to stay open to the possibility of healing. Please also read the Spiritual Forgiveness Prayer on this website. And always be willing to see the innocence in yourself– an innocence that continues regardless of the way you have been treated or the way you feel. I see you (and myself) safe and healed and whole, as indeed we already are in God. Grace's comment above originally appeared as a submission on this spiritual website. It attracted a wonderfully compassionate response from another visitor who also experienced her husband's infidelity. This is one of the more difficult ones. I experienced infidelity which lead to a divorce while my children were still quite young. Forgiveness is often a long process for the human nature, sometimes an impossible process. Patience is something that increases with time. I wanted instant relief from the emotional pain of infidelity, I wasn't remotely interested in the forgiveness lessons I could learn from life's unpleasant experiences. Truth be told none of us are really! Because these are spiritual lessons. No one can imagine how badly you must be feeling, my heart goes out to you - it'll take time and a strong faith to get you through you this. Human nature is often prone to be unfaithful, God is always faithful. Surrender all of your sorrow to him, you've already shown how strong you are, he'll make you even stronger. Move from How to Forgive Infidelity to share your own Forgiveness Story or read other people's stories on forgiveness. Move to read the list of forgiveness articles on this website. They are not specific to how to forgive infidelity, but the steps we follow to forgive are the same whatever the cause of hurt.